Local beers, live music, lovely food and lively fests...all of the fun of summer packed into five consecutive days. Tonight (July 31st) at The Muse Event Center: celebrate your love for local beer and Italian charcuterie at Cured and Crafted. The Consorzio del Prosciutto di Parma is pairing Minneapolis’ top chefs with the city’s finest craft brewers for a night of pigging out on Prosciutto di Parma and awesome beer. Eight local chefs will each serve a bespoke dish created just for the event and featuring Prosciutto di Parma. Better yet, each dish will be paired with a carefully chosen beer from a lineup of local breweries that includes Indeed, Dangerous Man, Bauhaus, and of course, Fulton. We're paired up with Chef Erick Weed from Rinata, who knows a thing or two about Italian cooking. Other chefs include Beth Fischer from Wise Acre, Landon Schoenefeld from Haute Dish, and Stewart Woodman from Union. Jason DeRusha is on hand to emcee the event, and Jake Rudh from The Current will be spinning the tunes, so the quality of entertainment will match the quality of food & beer. In the northern suburbs and looking to pick up some craft beer for the weekend? Kickstart the fun and swing through Northgate Liquors in Blaine between 6:30 and 8:30, where you'll find 100+ beers to sample from Fulton and other breweries, as well as the House of Hunger food truck. Whether or not you have Scandinavian ancestry, you're in Minnesota, so you should consider it your state-patriotic duty to attend The Bachelor Farmer's Kraftskiva festival each year. The 3rd annual party takes place Saturday from 5-10, and features loads of crayfish, local music, and beers by yours truly - including a Lingenberry Lonely Blonde specially infused just for this event. It's only $5 to get in, and the weather is supposed to be perfect on Saturday. See you there. 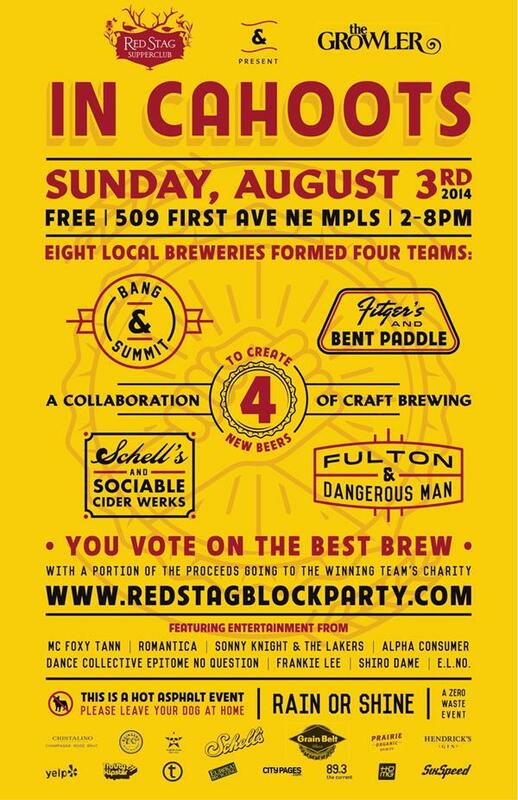 Save part of your Sunday for the 8th Annual Red Stag Block Party - this year retitled as "In Cahoots! A Collaboration of Craft." It's happening from 2pm-8pm outside the Red Stag, and it's free to get in. The Red Stag & The Growler are putting on the event, which is Minneapolis's first ever collaboration festival. Eight Minnesota breweries formed four teams to create four new collaboration beers that will debut at the party. You vote on the best brew, and better yet, a portion of the event proceeds will be given to the winning team's chosen local charity. In Cahoots! teams are: August Schell & Sociable Cider Werks Fulton & Dangerous Man Bang & Summit Bent Paddle & Fitger's We, of course, will be casting our vote for The 13th Task, which is the Golden Ale hopped with Mosaic & Medusa that we brewed with Dangerous Man. It came out of the tanks this week and it's delightful. Don't take our word for it - have one yourself on Sunday. Let's be honest: your Monday evenings are boring. So why not head to Tavern 4 & 5 in Eden Prairie for beers from 8 local brewers and pairings to boot? We can't think of a reason why not either. A $45 ticket gets you 8 delicious beer/food pairings and a rock solid excuse to do something interesting with your Monday. The event runs from 4-8. ALL-STAR WEEKEND, EXPANDED DISTRIBUTION, NEW GARAGE SERIES BEER, & MORE! We've been looking forward to this for quite a while now. Every month is a new adventure at the brewery, but July 2014 will be one of the most memorable in Fulton's five year history. We're commissioning our new brewery, adding distribution, expanding taproom hours and premises, and releasing a new beer, all while preparing to participate in the excitement the MLB All-Star game will bring to Target Field and the North Loop neighborhood. Next Sunday-Tuesday, Target Field is hosting the 2014 MLB All-Star festivities, and our taproom is geared up to keep all of you baseball fans refreshed and entertained. Here's a rundown of just some of the fun. Expanded beer garden: Just in time for the heart of summer, we've expanded our patio! The new beer garden area will include a mobile bar, so you'll be able to visit the food truck and get a fresh Fulton without even going indoors. Sunday taproom hours: Thanks to new Minnesota legislation this spring, brewery taprooms can now open on Sundays! We'll be open from 11-11 on this coming Sunday for All-Star festivities, but will also be open on pursuant Sundays, baseball game or not. Note that growler sales are still not legal on Sundays, so you'll have to enjoy your Fulton(s) on the premises. Food trucks & bands: Each day from Friday - Tuesday, we have a collection of food trucks and live music to please your ears and satisfy your hunger. See the full lineup on the right. Not to worry if you don't have tickets to the game -- you can still join us for a beer and an entertaining weekend. Brewed just for All-Star weekend, we're excited to release the Designated Bitter, an English-style Premium Bitter ale. Designated Bitter steps up to the plate as a session beer of 4.3% ABV and 40 IBU. It will be available only at a handful of downtown Minneapolis bars, as well as on draft and in growlers at the taproom beginning today. We're pleased to announce that Fulton is now available in Fargo-Moorhead! Fulton has partnered with Bergseth Brothers to distribute our beers in the Fargo area, as well as in Western Minnesota all the way to Park Rapids, and in eastern North Dakota as far as Jamestown. Availability in the new territory will be draft only in the first few months, until we're able to begin shipping beer from the new brewery in August - September. Ten months after getting the keys to our new building, we're brewing our very first batch today! Building the brewery has been a monumental effort; what we've lacked in sleep and days off over the last year we've attempted to make up with caffeine and SBA loans. The roller coaster ride of startup work is far from complete, but nonetheless the hiss of steam and the sweet aroma of wort coming to a boil are a warm sensory greeting from the first of many brew days in NE Minneapolis. We're not sure of the right way to express our gratitude to all of our customers, families, friends, suppliers, and everyone else who has supported us along the way, so we'll do so in the best way we know how, by brewing another batch of extraordinary beer.